When we first moved in to our new house, we knew the living room was going to need some attention to make it feel like home. The walls, windows, fireplace, and steps posed a challenge for where to place our sofa and where to position our TV. We wanted to put the TV above the mantel, but since the living room is elevated 2 steps, the ceiling is too low tho accommodate that. That paired with an awkward height of the stone fireplace. After a few weeks living in the space, we finally figured out where to place our sofa (facing a large window that we love looking out every day). But something still felt off – the stone fireplace was just so visually heavy for the room. Since I am a schemer I began to dream up ways to “deal” with this stone behemoth. I thought about removing a few stones, then all the stones, then painting the stones; but none of those options sat right. 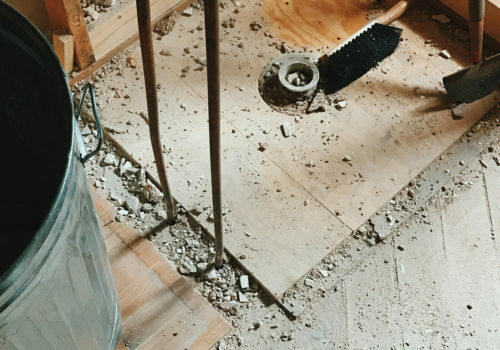 You see, we figured out that we actually liked the stone, just not the amount of stone that was exposed. The final plan was then hatched. I’d cover up a portion of the stone plus the mantel in a way that could be easily reversed in the future. We knew we would want the surround to be simple so now I just had to figure out the “how”. 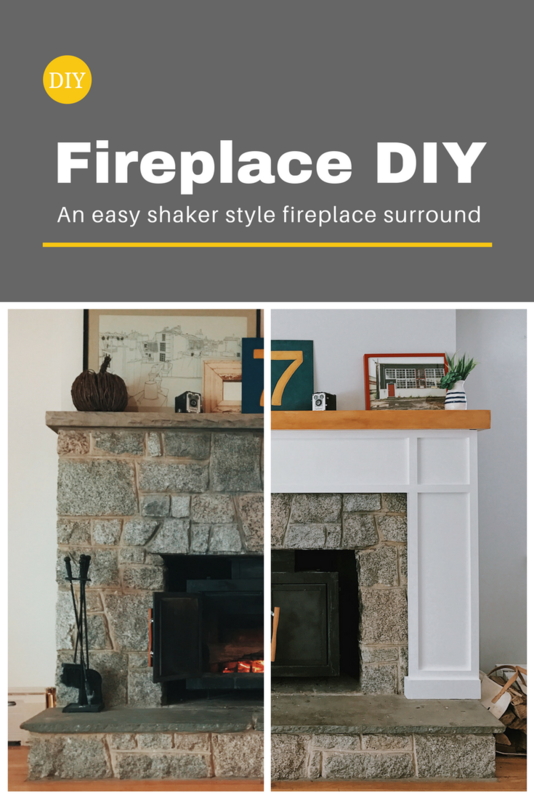 Every fireplace is unique so I’ll tell you what I did, and maybe it’ll be helpful for you too. I’m a sucker for MDF. I’m not sure why, probably because paint appears so smooth and the knots of wood won’t peek through a year after being painted. I was able to lay out our surround to use a single sheet of 4×8′ MDF for the panels plus several pieces of 1×3″ pine to act as the trim detail. For the surround, I built two ‘L’ shaped pieces that wrapped around the sides of the stone. 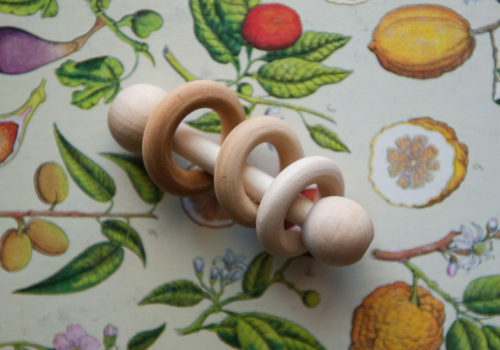 I attached these with pocket screws using the Kreg jig (I love that tool so much!). Once those were set in place I could measure the span of the front and cut the last panel to fit. This time attaching it with pocket screws right on the face, since I knew I would be covering those holes with the trim (see the picture for what I’m talking about). 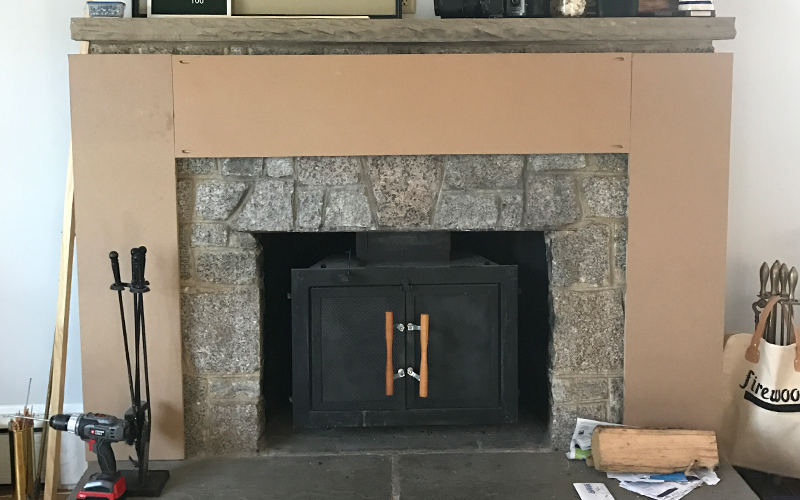 Once the panels were in place, I switched over to the mantel to make sure everything dry fit properly prior to adding the trim. For the mantel I made a ‘C’ shaped cover out of the dimensional pine that slid right over the existing stone mantel piece. 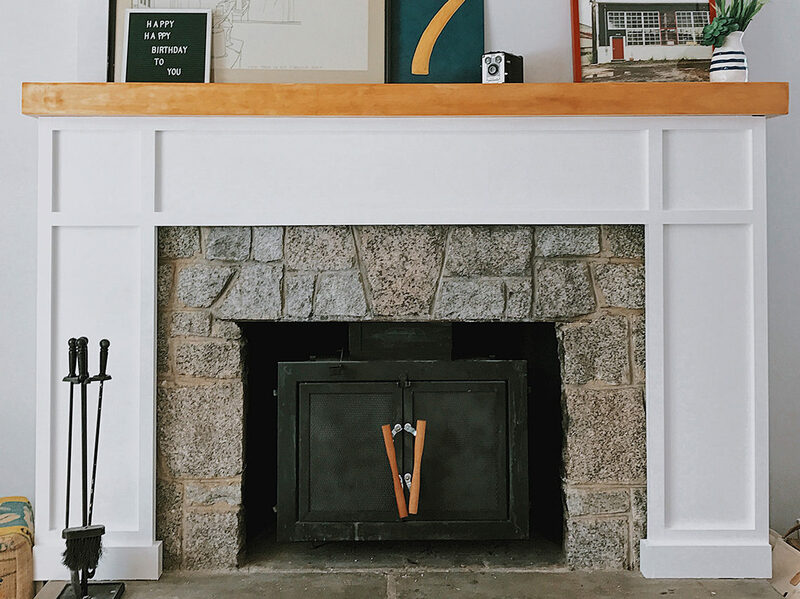 The new wood mantel sits on top of the old one and wraps around the front, sides, and bottom. 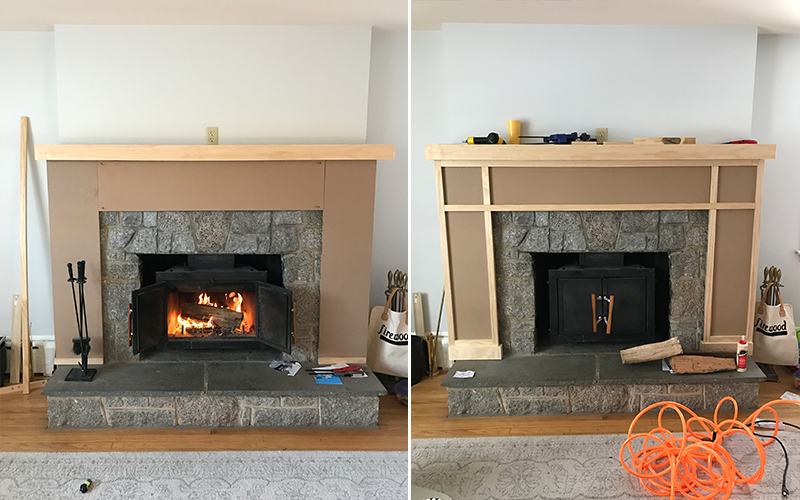 When I made the mantel I realized that I would need to raise the panels to connect without a gap. Fortunately I just chopped up some 1×3″ and laid it on its side to add the perfect amount of lift. Once the top and panels were dry fit, I began on the trim. I attempted to cut the longest trim spans possible to decrease seams and also add stability to the frame. Once I cut my pieces I attached them with wood glue and brad nails. 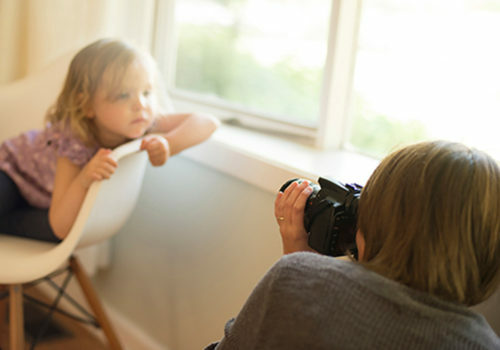 A few mistakes resulted in some crafty fixes, but all in all it turned out well. Once all the trim was attached I went back with paintable caulk to fill the gaps that were left in the trim seams. For the finishing, we painted the surround portion white with a semi-gloss trim paint. This should make the smoke residue a bit easier to clean off. For the mantel, I read a lot about staining pine and mostly the comments are, “It’s really inconsistent”. After much research and several small cans of rejected stain, I landed on using amber shellack. I was very nervous because I didn’t want to end up with the pine panelling look from the 70s for this wood. But with two coats it turned a nice amber color that matches the floors throughout the house. There is no doubt that a lot of improvements could be made to this surround. But we are so happy with how it turned out! 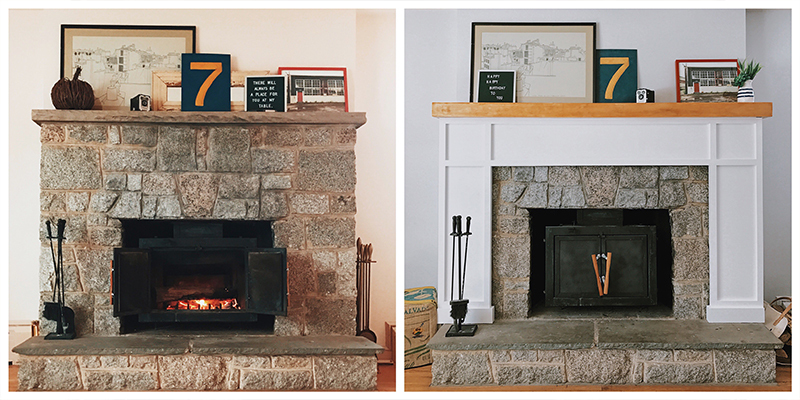 Our living room fireplace went from heavy to modern in just a few afternoons. I still need to finish some final trim pieces around the top and bottom, but for now it’s looking great. Up next is adding built-in style shelves along the walls on both sides. Nice work, Mike. It looks great!